... so it was perfect for a page featuring a double selfie of me and DH! 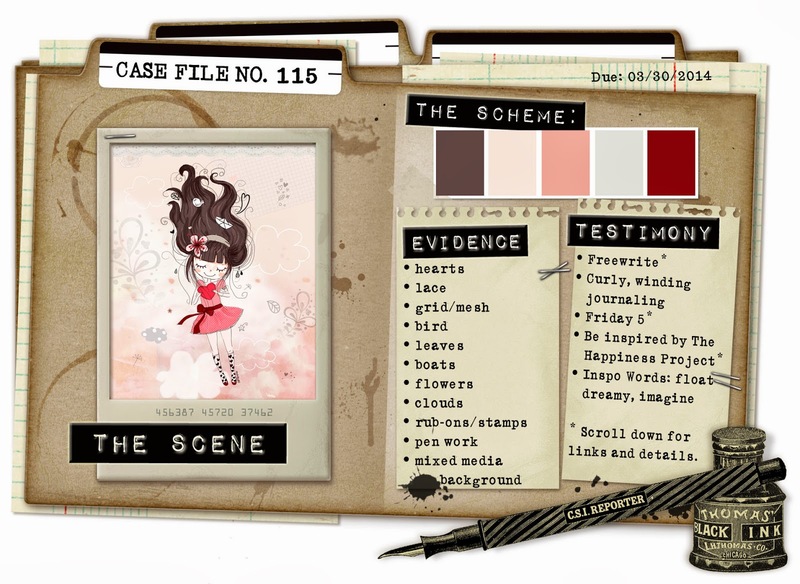 CSI Mastermind Debbi Tehrani has taken inspiration from this dreamy scene and put together a gorgeous colour combination, ideas for design elements and techniques, as well as some journaling prompts to make sure we tell our stories. So, did I follow all the clues? Evidence: hearts; grid; flowers; pen work. Testimony: IW dreamy, imagine and curly handwritten journaling along the top and bottom of the page, which reads, "you are my dream come true. i cannot imagine life without you." I used small squares from the MME Lost & Found Record It! "Heirloom" 6"x6" paper pad to create a grid pattern on the plain Bazzill cardstock, adding a journaling card from the Teresa Collins Daily Stories collection as a photo mat. Lots of hearts and flowers here, including a couple of home-made ones. The camera is a chipboard sticker from the Simple Stories Daily Grind collection - there was another heart on it, but the colour didn't fit, so I covered it with a button tied with twine. Thanks for visiting today - check out the gallery over at CSI for loads of inspiration and ideas!